This morning I dropped the kids at school (which was blissfully short after one child refused to go in yesterday and I spent 1.5 hours trying to drop him off. I tried. I failed. I tried again. I failed again. Multiple teachers tried. Multiple teachers failed. Until the school receptionist came to the rescue and although it is totally NOT her job, she magically kept him inside school as I left. All hail the mighty receptionist). So after this normal length drop off, I came home, popped my runners on and headed out, Baby N in pram, to pay the bakery and the butcher a visit. Bread in bag, bagel in hand, chicken and steak in the pram, home we went. 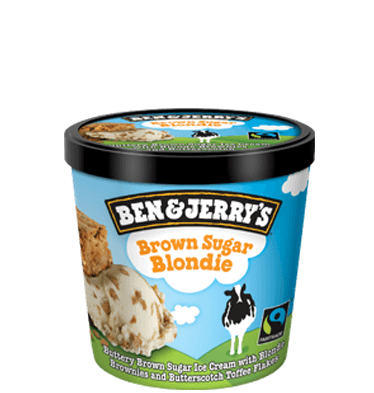 As I passed the corner store, I saw the Ben & Jerry’s fridge and I lingered momentarily. “Mmmm” said Future Shopping Girl. “That icecream will come in mighty handy later when you start craving that sweet, creamy deliciousness to comfort you through the difficult part of the day. Get in now and you’ll be SO pleased later”. “Nooooo” screamed Future Future Shopping Girl. “You’ll eat the whole tub and be filled with self-loathing and regret. And Ben & Jerry’s really isn’t THAT great icecream. It just has really amazing flavours. It always sounds better than it tastes”. “Future Future Shopping Girl is right”, I thought to myself. And I kept walking. Now, I know there are some people who can look at the poster, think “yum”, and carry on with their day. And there is that weird, small percentage who think “ugh too sweet”. “Too” and “sweet” are two words that simply do not belong together. I am neither of those people. And this is why I will never be thin or rich. I saw that poster and thought “Must. Have. NOW.” Tout suite. And then “OMG English toffeeeeeeeee”. Baby N was due for a nap and I had just BEEN in Bondi Beach, but I immediately started working out the rest of my day, and how I could work in a trip to Ben & Jerry’s. I don’t know if English toffee is any different to Australian toffee or French toffee for that matter but the words have always held a very dear place in my ice-cream flavour heart. My options were split – I could go after Baby N’s nap, buy a tub and eat it myself…….which isn’t great for the thin but better for the bank balance OR I could take the kids after school which is better for the thin but harder on the wallet. 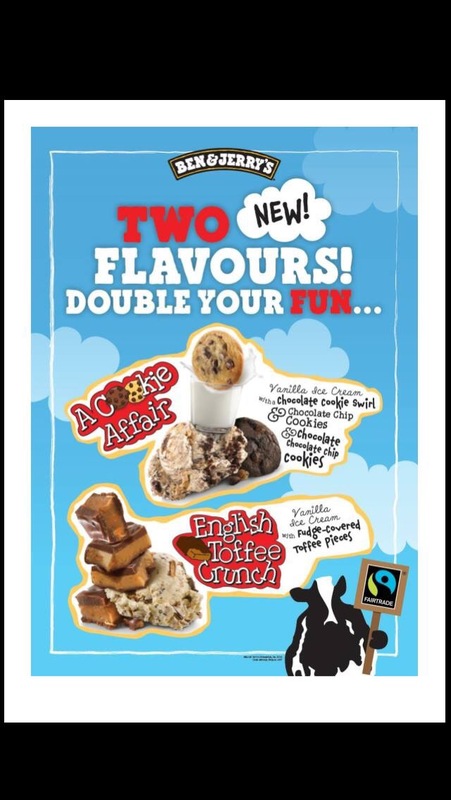 But I can’t just take the kids to Ben & Jerry’s……too much of a treat just for an everyday afternoon tea. So I start wracking my brains for a reason. Thinking…..thinking…..got it! First Born and J played in their first piano concert on Sunday and didn’t stop in the middle of their pieces shrieking “I can’t do this!” as they are wont to do at home. Sure, going for icecream straight after the concert would have made more sense but it was passable. planning what they should get. “You haven’t even got your reports yet!! And anyway – there is no such thing as a report present!” I shrieked. Let’s just say, the tooth fairy exposé pales in comparison. Report presents have been relegated to a thing of the past but the underlying problem still remains….which leads us to icecream for a piano concert 5 days ago. I kept planning. I would enjoy my icecream much more if I didn’t have Baby N on my lap shrieking for the spoon. I wondered if the new flavours came as tubs, or were only by the scoop. But if they were by the scoop, perhaps I could get it put into a take home pack? A brand new take home tub flavour. So now there were two flavours in store I needed urgently to try and one take home tub too. Butterscotch. Toffee. Cookie dough. Brown sugar. Blondies. Brownies. Toffee. TOFFEE. TOFFEEEEEEEEE. The words swirled around in my head like……flavours swirling around in icecream. It’s that suggestible personality thing again. And suddenly it was all clear – the reason I will never be thin or rich is purely due to icecream*. I decided that I would leave early to collect the boys, drive past Ben & Jerry’s. If there was a parking spot right outside, I would take that as a sign from g-d to pick up ice-cream for myself only (and Working Boy, of course). If there was no spot, I would take the boys after school. I drove past, and there was the closest spot to Ben & Jerry’s free, highlighted by a sunbeam streaming through the clouds. I went in and bought my HAND packed tub, but alas, they did not have Brown Sugar Blondie in stock yet. You should all know that A Cookie Affair and English Toffee Crunch are WORTH IT. Worth the calories. Worth the money. Worth shlepping Baby N in and out the car. Oh, and I also picked up a free Ben & Jerry’s 2015 calendar which, in a brilliant piece of marketing, has about $70 worth of B & J’s vouchers attached to the 12 pages, 2 vouchers valid per month. 2015 will be a great ice-cream year. P.S. On my walk along Curlewis St, I also passed a gorgeous new shop / gallery, which has the most awesome Astro Boy canvas I have ever seen. I was debating which son I loved most, who would get the canvas, when I discovered said canvas is $800. Unfortunately, as discussed, I’m prone to blowing the budget on ice-cream, so no-one gets the canvas, but I will be making a return trip to check out their smaller prints, and I would encourage you to do the same. *and possibly a very sweet tooth and a complete lack of self control. About a year ago, I met the editor of a very popular parenting lifestyle website. Sensing my enthusiasm for baby products, 4 kids on, she suggested I send in pictures of Baby N’s nursery. 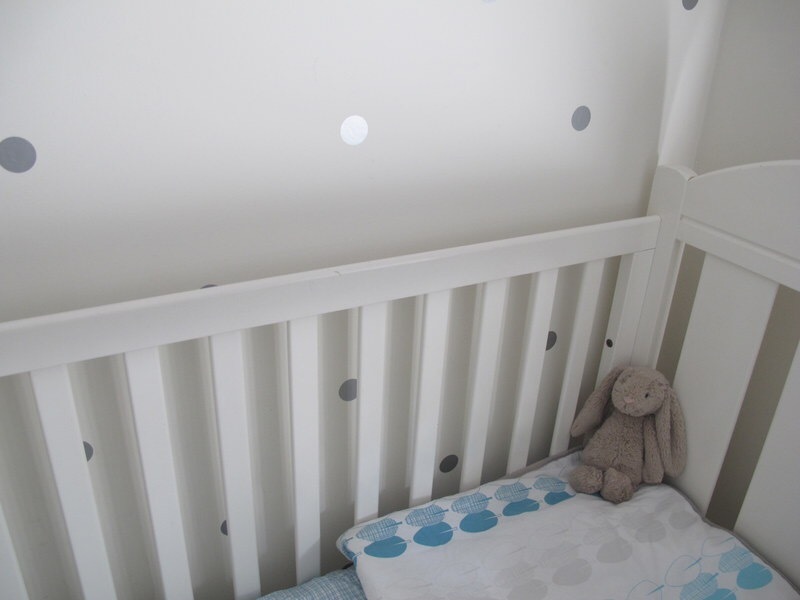 Every few weeks the website profiles a beautifully or interestingly decorated nursery. 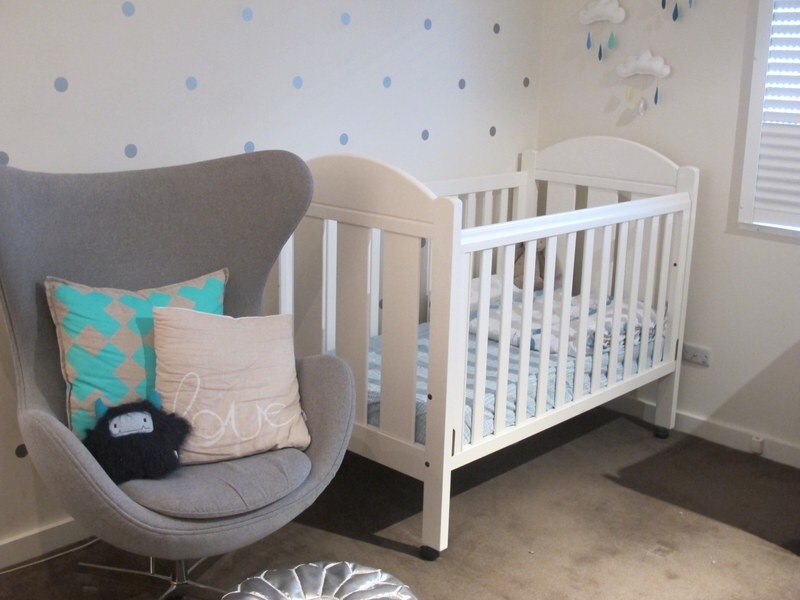 And so I did…..picturing the day when I would open my email and there would be Baby N’s nursery in all its tidied and photoshopped glory. Alas it was not meant to be. 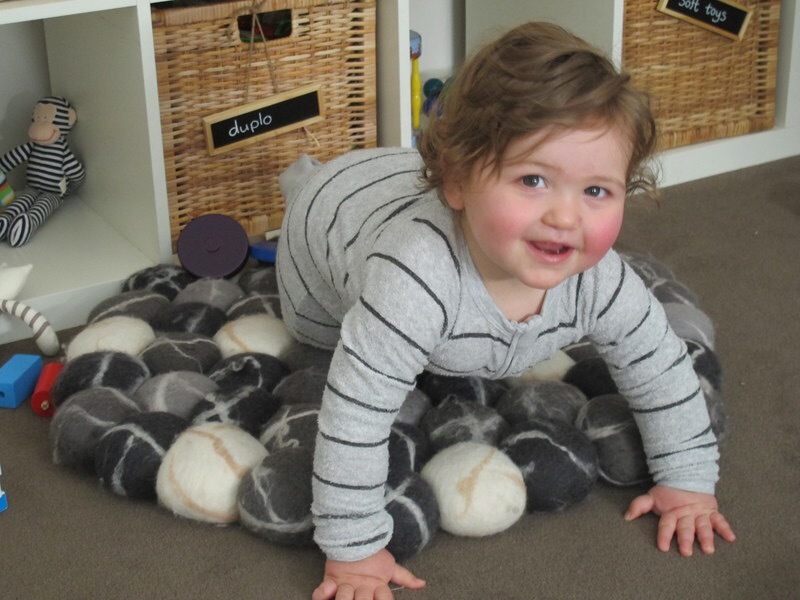 Unfortunately, countless other parents share my (flawless) aesthetic and I can only assume there was somewhat of an oversupply of dot decalled / metallic pouffed / incy egg chaired nurseries. Baby N’s nursery is simply not unique. But I don’t care. I love it. And luckily for me, as I have my own captive audience (you), I can profile my own nursery if I want. And want to, I do. 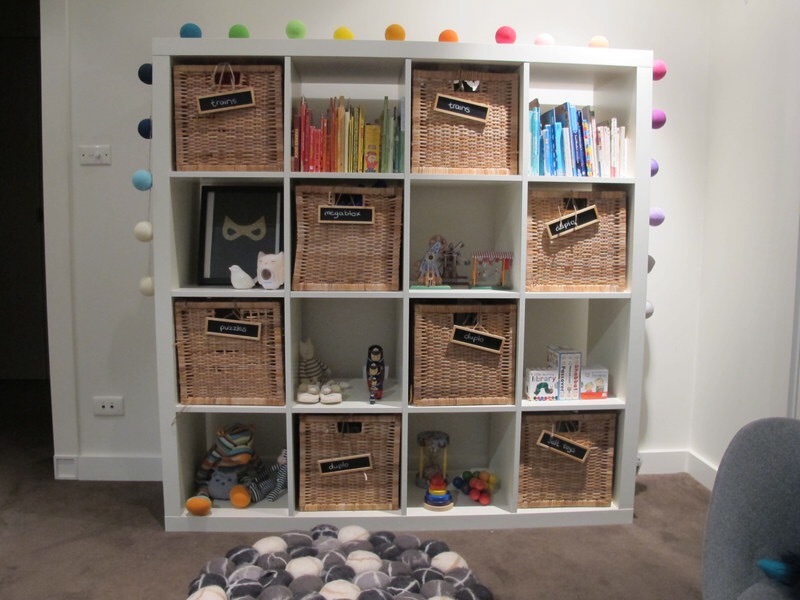 So without further adieu, I present to you…..
SHOPPING GIRL’S NURSERY PROFILE #1. SG: L, this nursery is exquisite. 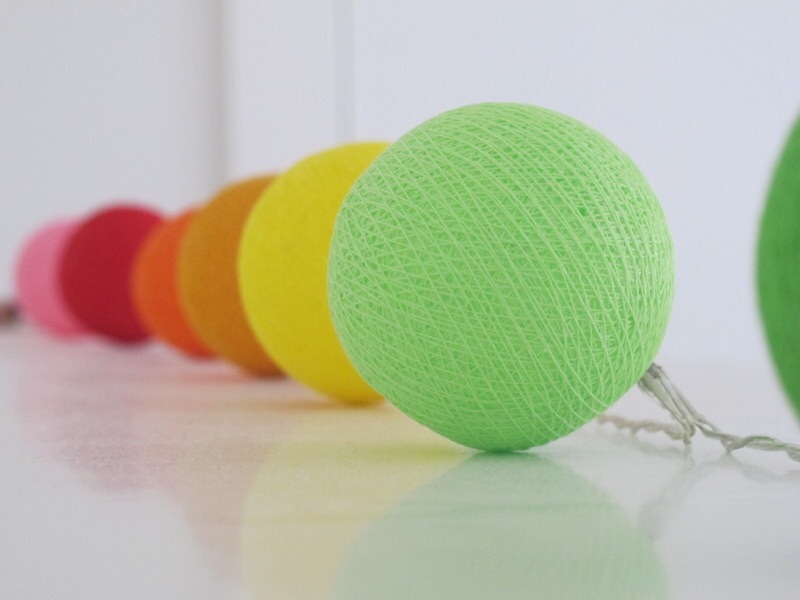 Are you a professional interior designer? L: Ha ha ha ha – not at all, Shopping Girl. I am a Pinterest/Instagram designer. I see it on Pinterest, I copy it. 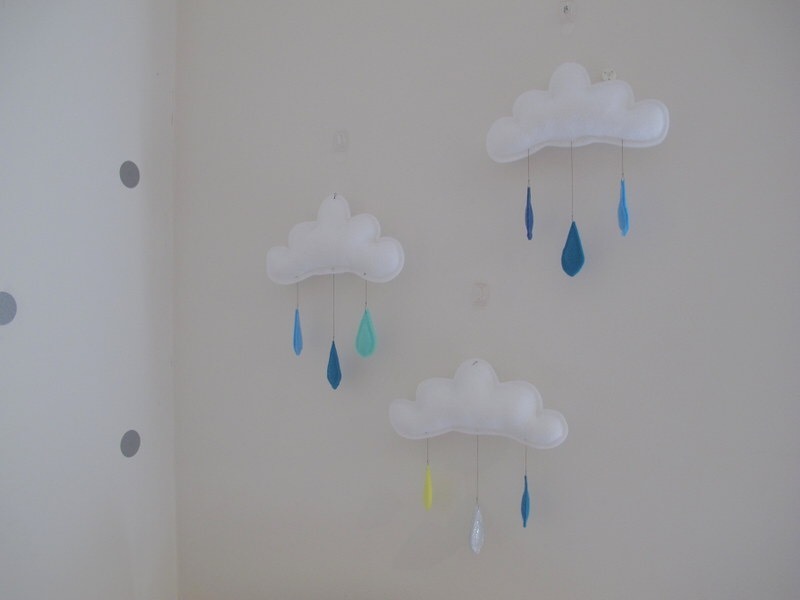 Instagram now provides the basis of Baby N’s room decor. SG: L, I understand this is your fourth child, 4th son, no less. How did you justify buying all this new stuff? L: Well Shopping Girl, I didn’t actually get that much new stuff. I bought a bit of new bedding, and change table covers, to give Baby N his own “look”. The change table and cot are the same I’ve had since First Born was born. 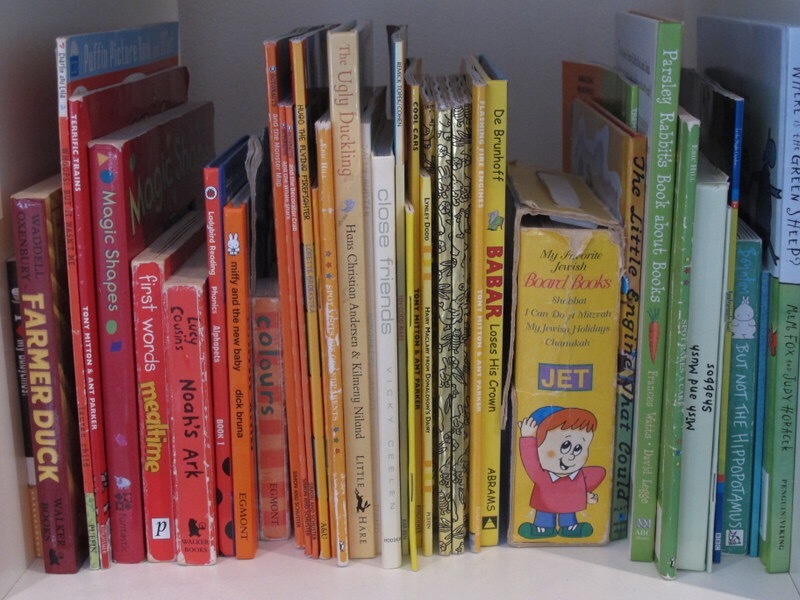 The Ikea Expedit shelf was imported from our old playroom. I just bought the cute little chalk boards (from Pottery Barn Kids) to fun it up. Lots of Baby N’s nursery was simply borrowed from other rooms in the house. I keep his little shoes, socks and hats in acrylic boxes that I bought years ago as party wear (disclaimer: I hate people in magazines who say things like this). SG: But the chair? You couldn’t get those 11 years ago when First Born was born! L: That’s true SG. You are savvy! So, previously I used a friend’s old Ikea rocker. Being ancient, it had started to make shocking squeaking sounds everytime I lifted myself off the chair. I don’t know if you’ve ever had a baby fall asleep in your arms, but let me tell you, a loud squeak announces to the baby “I am about to try and desert you”, and in that discreet movement, tiny eyes spring open and you lose 30 minutes of settling in an instant. My brothers and sisters in law chipped in for the chair when Baby N was born. When we no longer need a chair in the nursery I love that I can put it anywhere else in the house and it will look perfectly at home (There goes magazine mouth again). 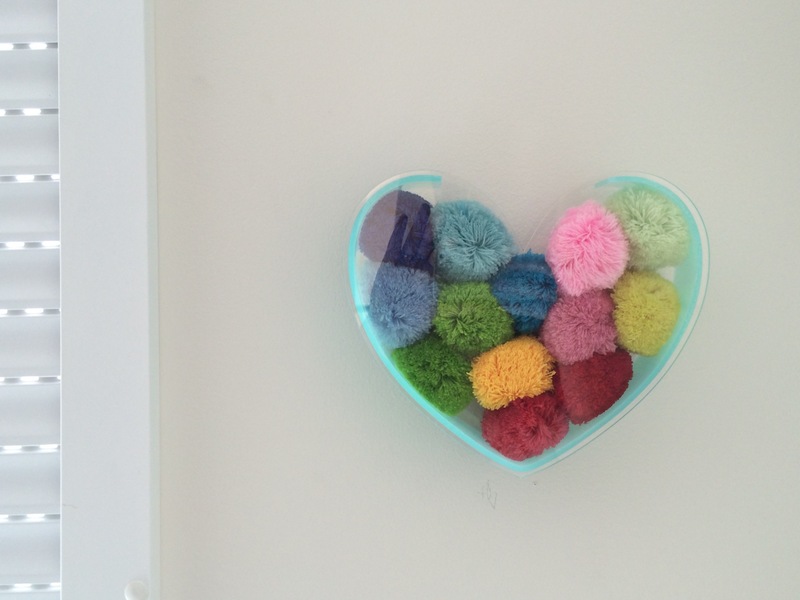 SG: What is your favourite thing about the nursery? 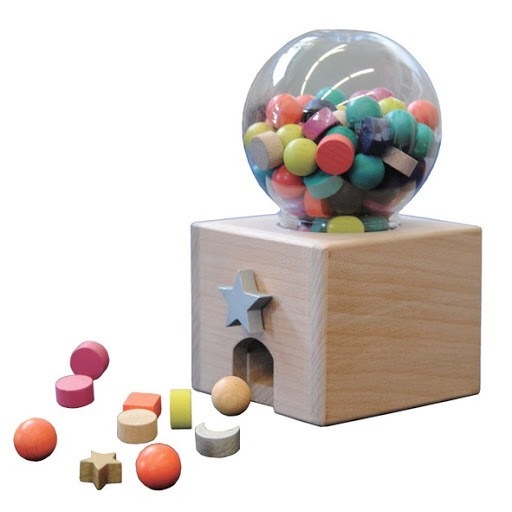 SG: Fine, what is your favourite INANIMATE thing in the nursery? L: Oooh that’s a tough one. 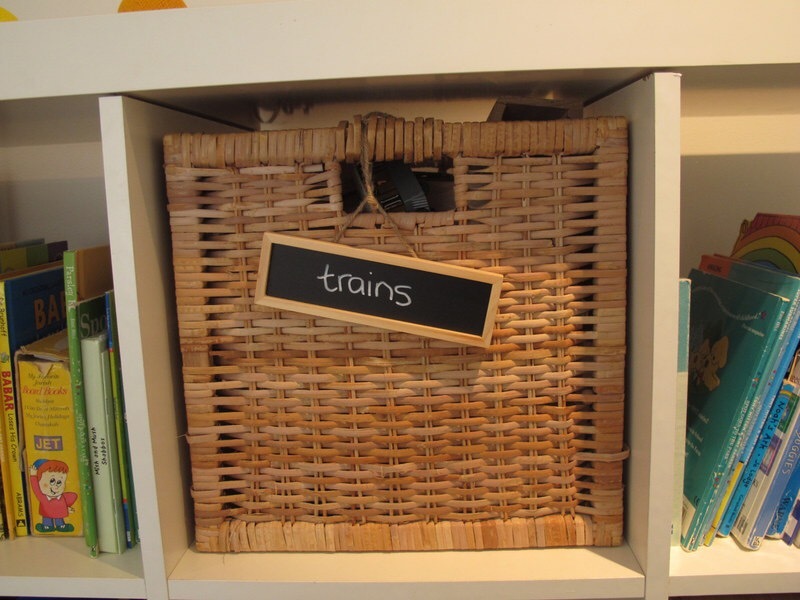 It’s actually a boring one – shelf space and wire baskets. As you can imagine with 4 boys I have A LOT of hand-me-downs to keep. Now, as Baby N grows out of one lot of clothes I can easily take out the next size. I can’t tell you how much I used to hate the change of seasons. 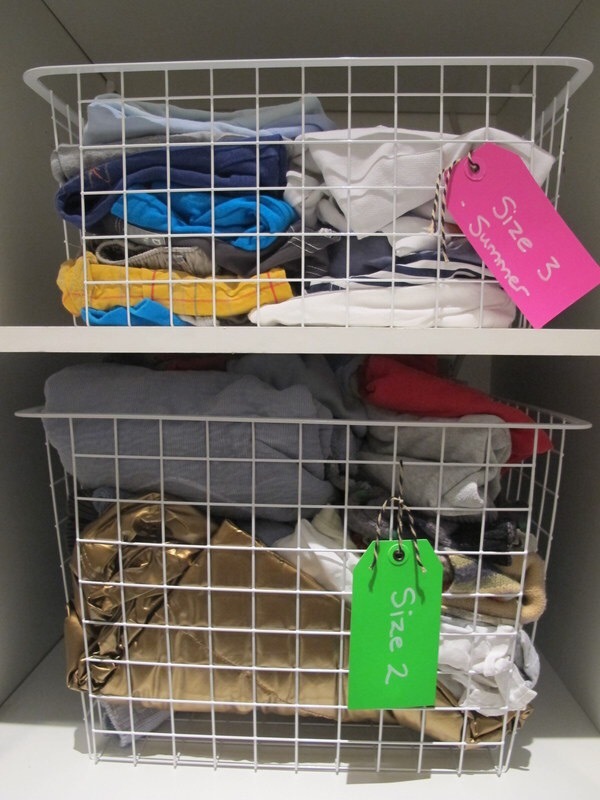 We had old clothes stuffed in cupboards and space bags all over the place. Everytime I needed to put away the boys’ old clothes or get out bigger ones for a child, it took hours of reorganisation and cupboard Tetris. I used to say the only reason I wanted a girl (apart from the obvious: frilly undies, tulle and sparkles) was so I could just buy new clothes each season and not have to go through this rigmarole twice a year. In the end it turned out I didn’t need a different gender, I just needed more cupboard space. SG: How did you know when the room was finished? L: Is it finished? It kind of looks finished but I keep adding things to it. 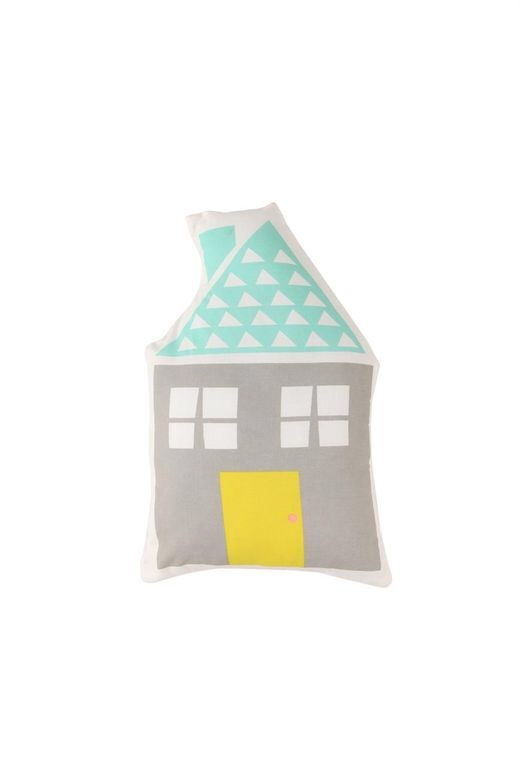 When Cotton On Kids releases cute little house shaped cushions for under $20, it’s kind of hard not to incorporate it (it now lives with the bunny in the cot. (Actually that’s not true. Master 6 has decided bunny is his. The house is alone. Bunny now lives with Master 6 and his three identical teddies. But that’s another story for another day). I keep adding things. It’s a sickness. Working Boy: Is it treatable? L: You should know, you’re a doctor. No. 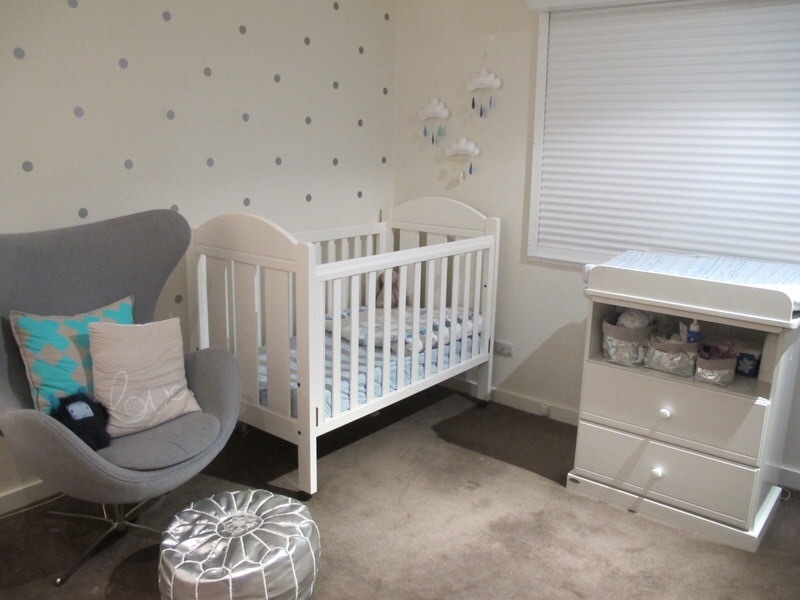 SG: What’s next in the nursery? 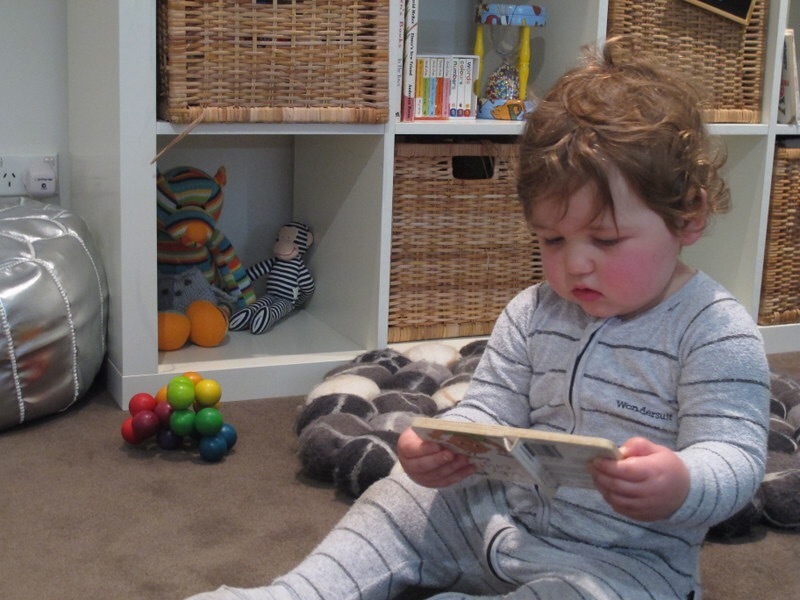 SG: Well let’s have a look at the rest of this nursery then…. L: Thanks for having me, SG. It’s always a pleasure to see you. Sometimes you’ve just got to fake it ’til you make it. Except when there’s no hope of making it, what’s a girl to do? I keep waking up looking like death. Pale, pasty, dull. This has much to do with Baby N having a spate of mildy bad health recently, and consequently me having MILDLY* disrupted nights. Not only do I not want to look in the mirror, I can’t imagine staring at this bleary,pale, smudge of a face inspires much confidence in my family. So I fake sleep. This involves a lot of caffeine and a few key skin products. I chop and change my skin routine a lot. I am the most disloyal customer imaginable. Or to put a better spin on it, I am a beauty chameleon. Even when I love something, there’s always something new to try when it’s close to running out (I can count on one hand the number of products I have actually finished to the last drop). Possible I have mentioned before I am an advertiser’s dream. I believe spin. Or to put it another way, I am trusting. Sometimes naively so. When my sister first said “The word gullible has been taken out of the dictionary”, I said “Why?”. I really BELIEVE that the new Omo will lift more stains than the previous one. So coupled with my love of magazine reading, when they profile that new serum that’s gonna drop 20 years off your face, I am queueing at the counter. But I digress. You’re not interested in what a gullible junkie I am, you want to know how I glow (yes you do, because that is the topic today). So I wash my face in the shower, apply a serum, and I’m already looking slightly better. But then comes the first key product. 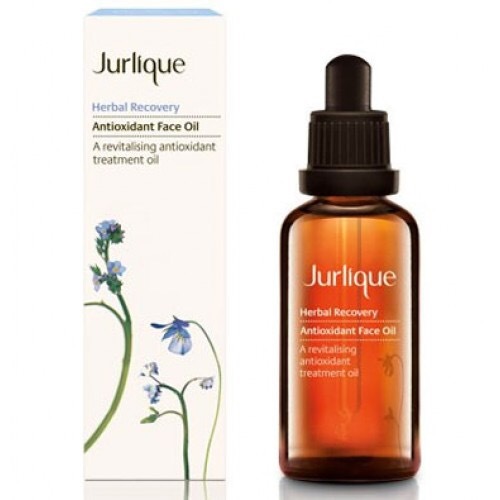 Jurlique Herbal Recovery Antioxidant Face Oil. Adorebeauty sent me a sample of this with my last order, and it just goes to show that sending samples pays, because a couple of weeks later I ordered the full size product). A few drops of this pressed onto my face (although to be honest, I rub and swipe more than I lightly press) and honestly, I look at least 30% better than I did 10 seconds previously. I look glowy, rested. And I smell amazing because Jurlique smells of eau de day spa. Feeling all happy with myself I get dressed and go and face the zoo downstairs. On goes sunscreen and moisturiser in amongst the getting of breakfast (me), the eating of breakfast (the zoo), the finding of uniform (me), the getting of socks which have been left upstairs (me), the fielding of never ending questions (me), the putting on of shoes (me and zoo – combination effort), the swearing under breath (me, me, me). Then comes key product number two. Nars Light Optimising Primer. Also sent to me initially as a sample by Mecca Cosmetica. It has a pearly finish, designed to give me, what the beauty industry refers to as the “lit from within” effect. I hate that phrase. It makes me think of bad heartburn, and has me reaching for a Rennie just reading it. I prefer “candlelit”. That makes me think “glow” more than “burn”. On it goes. Now I am glowing, and my complexion is smooth enough that I need just a very thin layer of foundation. However, I am still pale. I need a bit of colour. Some blush on the cheeks (I am partial to this at the moment). Very summer. Very fresh. A little bronzer and….hello! Alive! Well slept! Relaxed and freshly holidayed! Except, the body. Nothing says Aussie girl like bronzed limbs. But I was born in England; ergo I come in two shades – pink, and pale pink (winter). Clothes simply do not look as good with two pink pins poking out. And so I have to fake this too. Right now I am loving St Tropez Luxe Dry Oil, as suggested my one of my trusty magazines. I don’t know if it is fool-proof, but it is mother-trying-to-get-showered-and-dressed-in-under-10-minutes-proof. It has a colour and shimmer to it, so the effect is immediate, as well as becoming more permanent over the subsequent few hours. No bad smell. Moisturising. No streaks or patches. Dries fast. I’m sold. At least I am until the bottle is running low and I read about something that sounds better…..
*in the ironic sense of “mildly”. I can’t remember how to write. Actually it’s not really the writing that’s the problem. It’s the time. I cannot remember how to make time to write. Cerebrally I know it is possible. I am no busier now than I was a few months ago, although arguably Baby N is at a somewhat all-consuming stage. I am busy but I am not so busy that there is not a single second to spare. As finite as it is, time can also be elastic. You can always squeeze a little more in. It’s like storage. Sometimes when you think there’s just none left, somehow if you just re-arrange the cupboard, or throw away a couple of things, it all fits again. The only difference is, when you really can’t fit anything else in, you can always buy more storage. I love storage. It’s a first world shopping category, storage. In order to need storage, you first need lots of stuff to store. A guy called Howard has made an absolute mint, no doubt, off our inability to limit our rates of acquisition, married with a desire for our homes to appear clutter-free and orderly. Howard is a clever man. He knows that when I run out of coat hangers, I don’t think to myself “gosh I really have too much clothing”, I think “I need some more coat hangers”. When you need clear perspex boxes to organise your make-up you have TOO MUCH make-up (and I know I do, because mine doesn’t fit in all my little Perspex boxes). 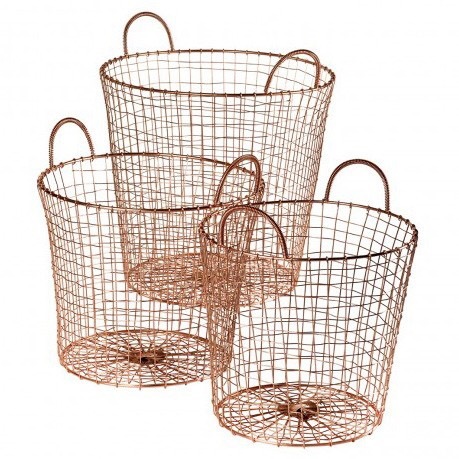 Wire Baskets (mine are these Robert Gordon Fishing Baskets). There are variations on this theme popping up everywhere. We all know I love everything metallic but these are so useful. I have nappies and wipes in one, magazines in another and a proliferation of toddler toys in the third. Fisher Price has never looked so chic. These are EVERYWHERE. It started with Uashmama. 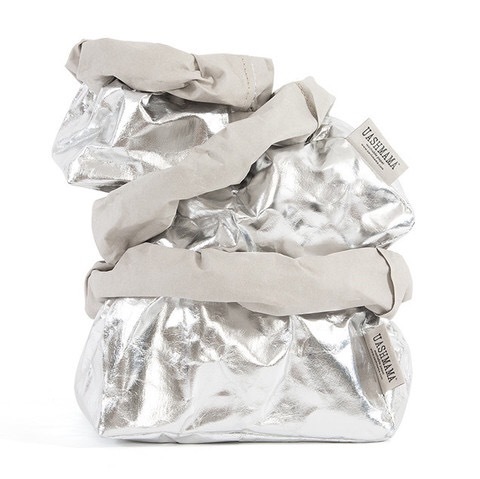 The second I saw those silver bags I snapped them up for Baby N’s nursery. I can’t say it improves the experience of changing a nappy. And some may say that storing nappies seems to have taken up a not insignificant percentage of my storage budget in the last year. 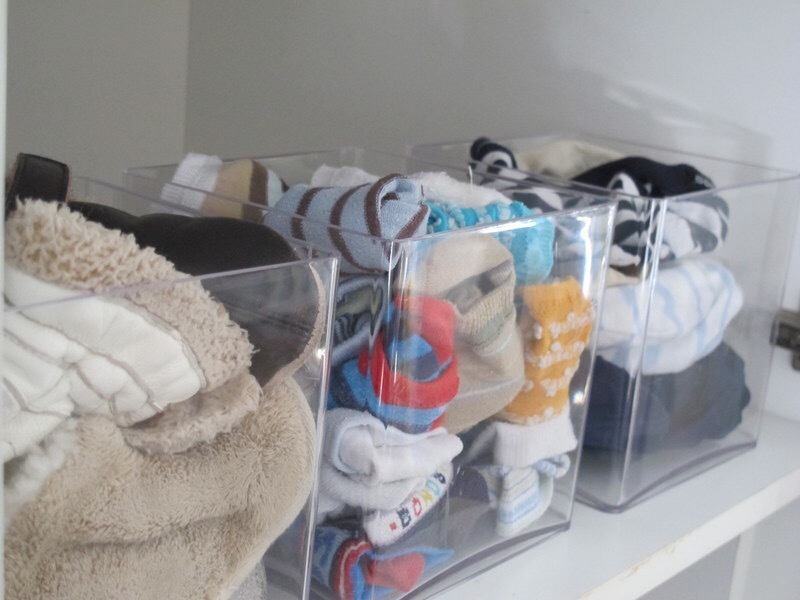 My rule is simply that whatever I buy must be multipurpose – when it’s done storing nappies (that time seems so far away) it needs to have a future elsewhere in the house. 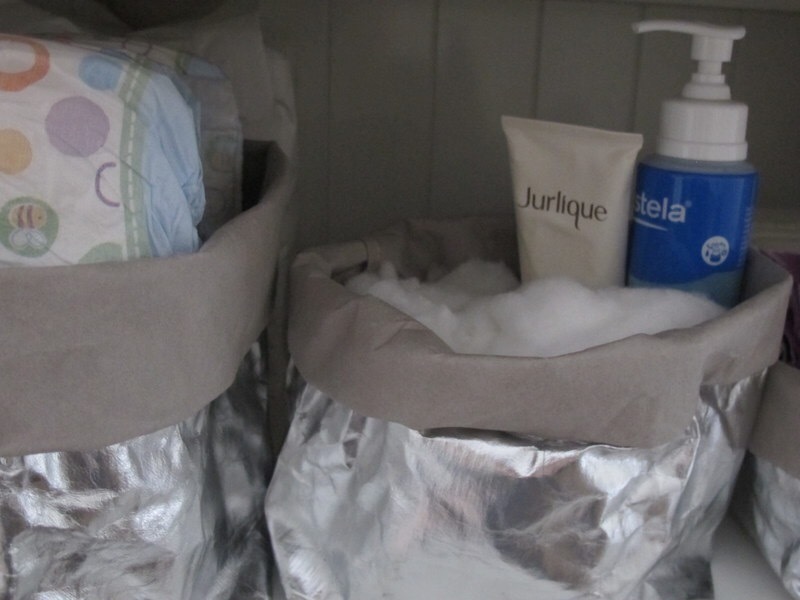 For now, the change table is organised and the nappies look better in little silver sacks. Except used ones which look better in plastic sacks in the outdoor rubbish bin. Country Road have just released some washable paper bags too, in plain neutrals. I’m thinking they’ll be perfect for Lego storage. Lego storage could definitely be a post of its own. Even if I just detailed the history of our Lego storage journey (p.s. If you store Lego in woven raffia baskets, the Lego absolutely WILL disappear into the raffia). The important thing for you to take away is that with 10 years of Lego storage under my belt, I am thinking that washable paper bags might be my best stylish solution yet. 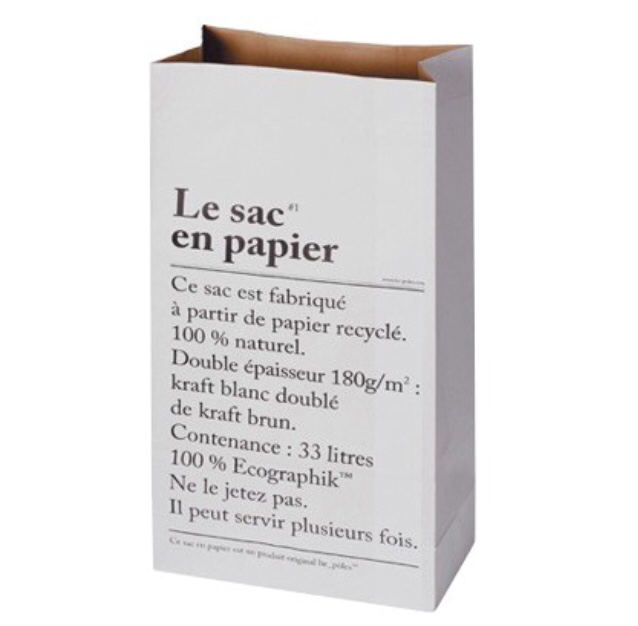 These are much like the washable paper bags except not washable and more papery. Thick, tough paper. I have recently purchased two. First, the toy bag, by Tellkiddo. 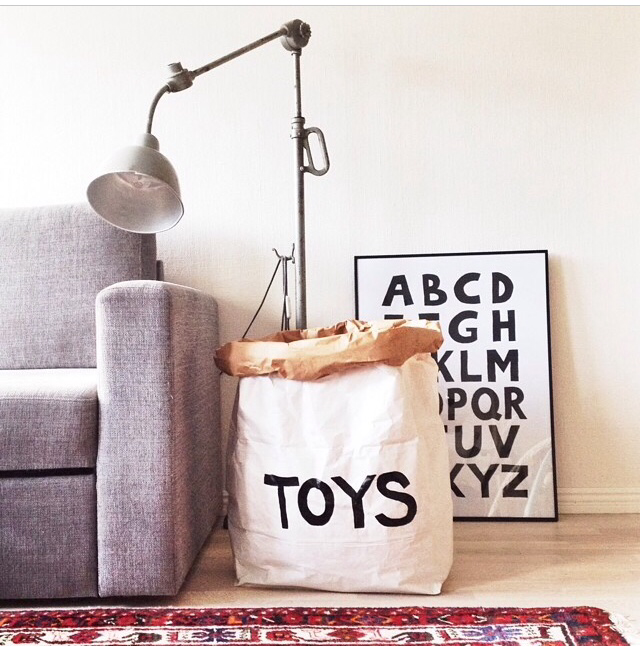 It has that whole Scandi vibe that I love so much, the toys look neat and organised in it, and what’s more it makes it SO easy for the kids to work out WHERE they need to put the toys. I have a lot of complicated organisational systems, and then I wonder why I am the only one who knows where everything goes. This one is self explanatory. Right now I have soft toys in there. They look really cute peeking out the top. 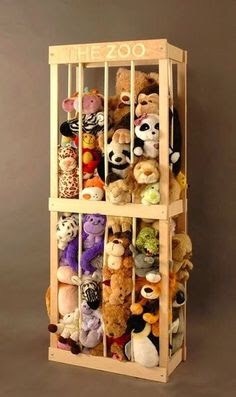 A very happy solution to a very annoying problem (what to do with all the bloody soft toys), and much cheaper than that cute soft-toy zoo. 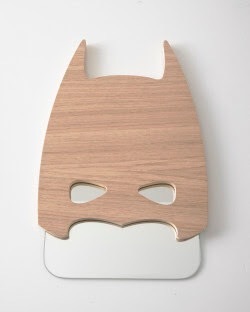 There are so many places I want this in my house. Right now it is being used as a waste paper bin in First Born’s room but the bag is showing a lot of promise. I think a promotion could be on the cards. The best thing about all these bags (and their sister, the coated fabric bag) is that they look great standing alone, sitting on a shelf or as part of a storage system, like the omnipotent Ikea Expedit. Win, win, win. What is with wooden crates? They are sooooo unbearably chic. Especially if they are vintage, or look vintage, or they could just be repurposed and not that old at all. I am on a major hunt for the perfect crates. I want to put our piano music in them. They will provide the right amount of “rough” in my polished lounge room. I love these at Loft Furniture. I like the wheels. You know, cos me and Working Boy live such a spontaneous, fly by the seat of our pants life that we just never KNOW when we’ll need to wheel something from one room to the next. Who can tell? You just can’t limit us to keeping our possessions in one room. That’s just how we roll. Haha. Roll. Wheels. Hilarious. Or maybe just a bit tired. Anyway that’s me. And that’s a wrap on storage.